Ying Guo and her colleagues in the Center for Biomedical Imaging Statistics collaborate with researchers, many from the school of medicine, who are trying to understand the underlying brain anomalies of mental disoders. Structural magnetic resonance imaging (sMRI) shows the tissue types across the brain. Functional MRI (fMRI) show changes in the neural activity level of different gray matter areas of the brain. Ying Guo is working to transform such aspirations into reality using math. Really, really sophisticated math. Guo is director of the Center for Biomedical Imaging Statistics (CBIS) at the Emory University CBIS drives research and ultimately clinical practice by developing specialized statistical techniques tailored for data collected through biomedical imaging studies. The center includes another core faculty member — Suprateek Kundu — several affiliate faculty members, an application developer, postdoc fellows, and doctoral students in biostatistics. The center often collaborates with researchers, many from the school of medicine, who are trying to find the underlying brain anomalies of mental disorders, drug cravings, and other mysteries of the mind. 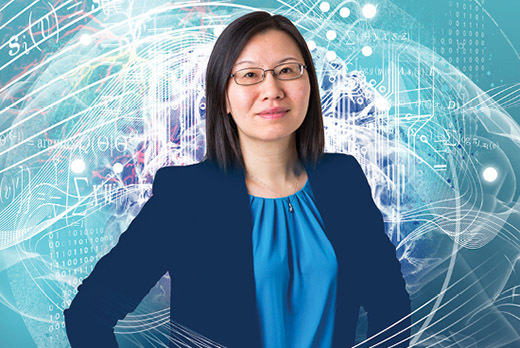 Guo and her team at the center provide the necessary mathematical muscle, devising the statistical models that can take in the vast, cacophonous universe of data produced by today's sophisticated scanning technologies — sMRIs, fMRIs, and DW-MRIs — and pull out the meaningful tidbits of information.